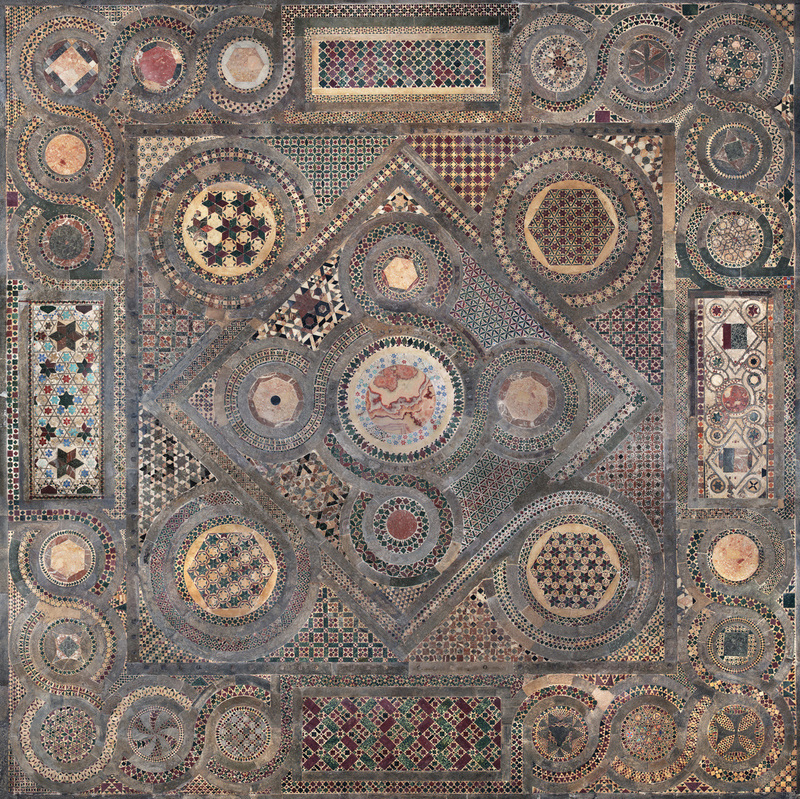 I see from the recent story on the opening of Westminster Abbey’s triforium galleries that I am not alone in my obsession with its Cosmati pavement, the glorious inlaid semi-precious stone, marble, metal and glass mosaic in front of the High Altar. It was commissioned by King Henry III for his rebuild of the less glamorous Abbey built by Edward the Confessor. Odoricus, an Italian mosaicist trained in the geometric, abstract, allegorical Cosmati style, brought tesserae from Rome and combined them with local materials to create a unique pavement. The mosaic was finished in 1268 and has been the epicenter of monarchical ceremony ever since. Thirty-eight kings and queens have been crowned on the Cosmati pavement. Trod upon for centuries by the softest royal slipper and roughest pilgrim clog alike, the pavement suffered greatly from wear and ground-in dirt. 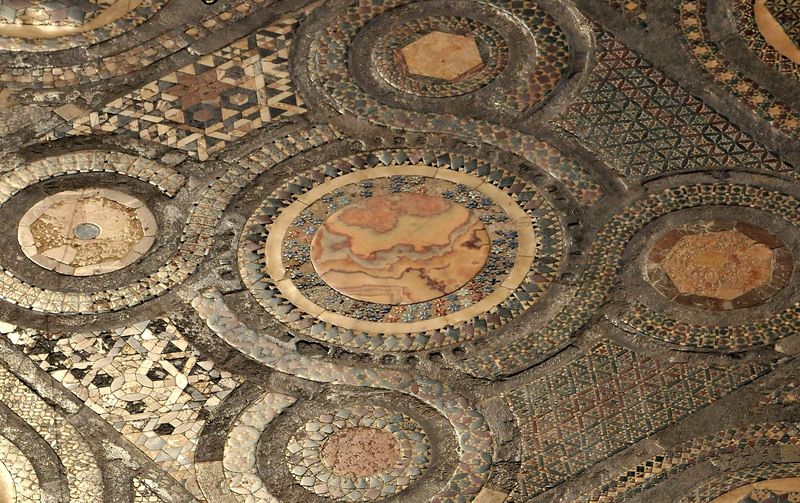 The marble tiles, which Odoricus is believed to have sourced from the remains of ancient Roman floors, likely had a millennium’s head start on wear, and layer upon layer of wax and polish only served to darken and dim a surface that had once been vividly colored and highly reflective. Concerned about its deteriorating condition, church officials covered most of the Cosmati pavement with carpet in the 1870s. 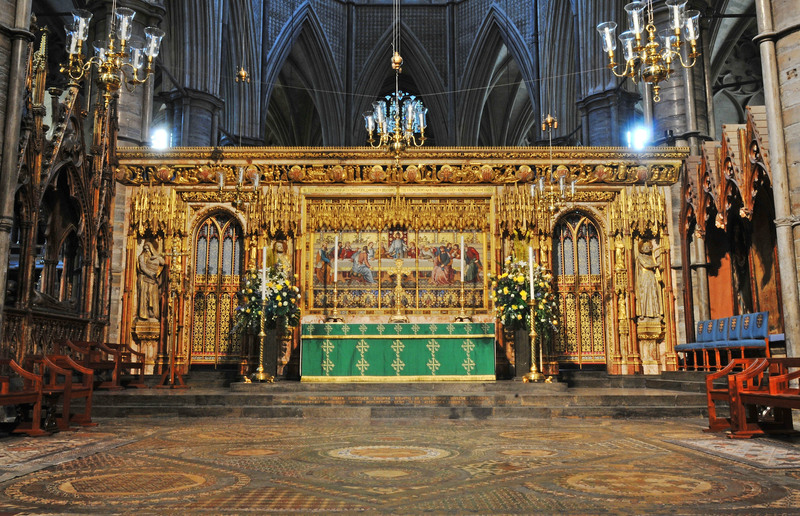 That’s how it remained, revealed in part or on rare ceremonial occasions until 2008 when Westminster Abbey undertook a comprehensive two-year conservation project. The team cleaned the surface, removing the old wax, polish and dirt with specialized solvents. Stone and glass conservators stabilized damaged areas, repairing damaged glass, stone and mortar. The last step was applying a new protective coating to make it possible for the pavement to be displayed safely and to its best shiny, colorful advantage. When the conserved pavement was finally revealed in 2010, I yearned to write about it but how could I without proper high resolution before-and-after images? That would be just be cruel. Unfortunately, no such photographs were to be found, not from the Abbey’s communications department, not in the press, not from funders like the Getty which is always great about providing high-res pictures when it comes to its own projects, not even in a publication that I could buy. To this day, almost a decade later, as far as I know there are no books whatsoever documenting the conservation. The recent discussion on the Cosmati pavement view from the triforium drove me to try one more time. I checked a site dedicated to the conservation that the Abbey had put up in 2012, hoping its sad little 500-pixel images had been upgraded, but the site doesn’t exist anymore. Then I checked YouTube. 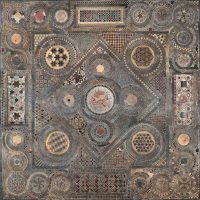 Y’all, Westminster Abbey’s channel has a playlist of 51, count’em 51, videos covering the history, symbolism and conservation of the Cosmati pavement. These films are absolutely riveting. Interested in the background of Henry III’s commissioning of the mosaic? Done. Curious about the cosmological significance of the design and how the precise date of the end of the world is calculated in the inscription? Keep watching. How about those glass tesserae so atypical in Cosmati style mosaics? Six videos about them enough for you? Want to hear from the stone masons about the Purbeck Marble background repair? The mortar repair? The yellow limestone repair? The black marble repair? Boom, a video for each. Clear your social calendar for the next few days and make way for the greatest playlist ever played. This entry was posted on Thursday, June 14th, 2018 at 5:09 PM	and is filed under Medieval, Modern(ish), Multimedia. You can follow any responses to this entry through the RSS 2.0 feed. You can skip to the end and leave a response. Pinging is currently not allowed. Woohoo!! Can’t watch them till I get home but you better believe I will! Also to be prodded by the first video, as non native English speaker, to find out the difference between ‘feet square’ and ‘square feet’.